Washington senior Maddy Jenkins serves for the Lady Lions during a non-conference match against Clinton-Massie Thursday, Sept. 6, 2018 at Washington High School. Jenkins led her team with five ace serves. 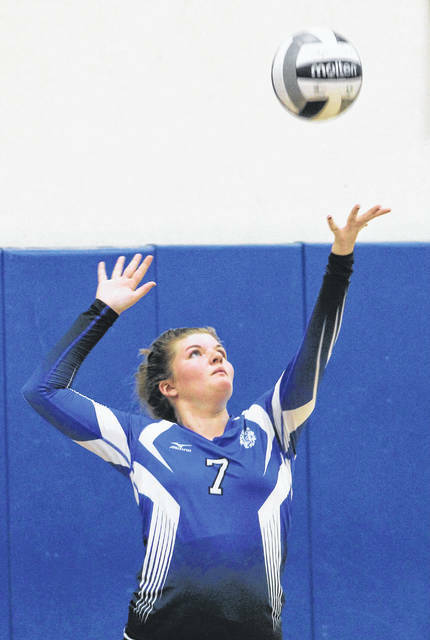 The Washington Lady Blue Lion varsity volleyball team hosted former South Central Ohio League rivals Clinton-Massie Thursday evening. The Lady Falcons won the match, three sets to one. Washington won the first set, 25-20, but Massie won the next three, 25-23, 25-18 and 25-22. Hannah Haithcock and Rayana Burns shared the team lead in kills for Washington, each with 11. Maddy Jenkins led Washington with five ace serves. Burns had three aces and Mallory Hicks served three aces. Burns also led the team with 10 solo blocks. Brittney Wilson had seven solo blocks. Aaralyne Estep led the Lady Lions with 15 digs. Halli Wall led Washington with 22 set assists. Washington’s next match is at Western Brown Monday with the j-v match starting at 5 p.m.